Yuribia Munoz, Ph.D. candidate in the Department of Earth and Atmospheric Sciences, will spend six weeks at sea participating in a research expedition to Antarctica. It will be her third field season there as a UH student. 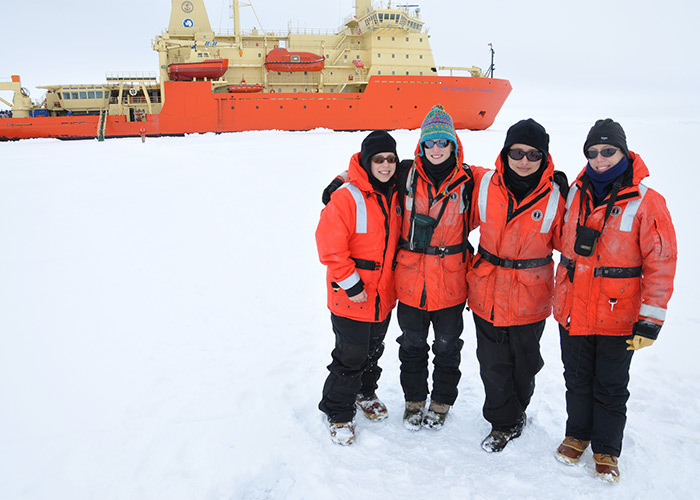 Read Yuribia Munoz’ “Hello Antarctica” BlogThe expedition, aboard the research vessel and ice breaker Araon, is led by Dr. Min Kyung Lee and Dr. Sun Han Kim from the Korea Polar Research Institute (KOPRI). The purpose of this expedition is to reconstruct paleoenvironmental changes on the Antarctic continental shelf and characterize the retreat history of the West Antarctic and Antarctic Peninsula ice sheets. The work will help scientists better understand modern processes and predict future changes in the ice. In addition, scientists expect to gain insight into the process of warm water incursion from the Southern Ocean onto the continental shelf, which has recently contributed to higher melting rates around Antarctica. The RV/IB Araon will leave the port of Lyttelton, New Zealand, and sail for 12 days until reaching the Bellingshausen Sea, southwest of the Antarctic Peninsula. Researchers will spend several days in that area collecting geophysical data, including multibeam swath bathymetry and shallow marine seismic, and a series of long sediment cores. Munoz will have primary responsibility for collection and interpretation of bathymetry and shallow seismic data, and she will assist with sediment coring. The cruise will sail along the western Antarctic Peninsula and return to port in Punta Arenas, Chile. Munoz's participation is part of an ongoing, long-term research collaboration between UH's Antarctic scientists and colleagues from KOPRI. This is the fourth shared Antarctic cruise with researchers from both UH and KOPRI.